Proper service of process is the start of many legal claims. You notify your employer that you are bringing a suit based on what you believe was a wrongful termination. You notify your roommate that you are initiating formal eviction proceedings. Serving this notice begins the timeline on the legal clock. 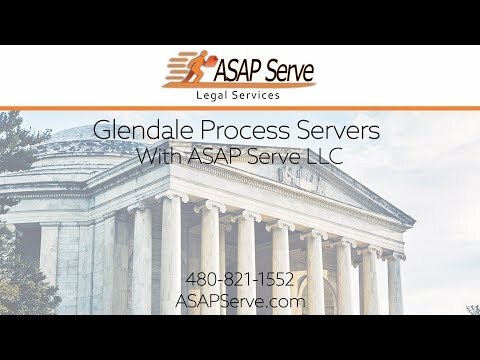 Hiring a reputable process server in Glendale can ensure that the proper legal documents are served to the right person at the right time. If you hire someone and they make a mistake, the legal case can be postponed or otherwise jeopardized. People will go to great lengths to avoid getting served with legal papers. The proceedings can’t begin until they are served, in most cases. Some will hide away inside their house for weeks or months until the coast is clear. Some will even wear disguises or take steps to conceal their movements. The best way to easily serve a person is to do it before they know what’s coming. You can blow your own chances by letting the person (or agent) know that you are going to be initiating legal proceedings against them. Your process server can blow it by letting the person know their role. For example, the process server might make inquiries about too loudly or might wear clothing or other things that identify who they are. A good process server will avoid these mistakes by practicing discretion in all activities. Some inexperienced servers will deliver the papers by taping them to the door, dropping them in the mailbox, sliding them under the door, or even mailing them via certified mail. In Arizona, only evictions can be taped to the front door without a signed order from the Judge, provided it is mailed certified if you have 5 or more days before the scheduled court date. None of these methods are legally enforceable, unless ordered by the court. The documents have to be served in person, and there has to be proof that they were served and to the right person. There are many instances where the documents can be given to a co-resident of suitable age; an experienced process server will know when that option is available. Once a document is taped to a door, there is no way to know what becomes of it. Someone could take it and lose it. The wind could blow it off. It could be taped to the wrong door. The only way to know for sure that the documents make it to the right person is to put them directly in the hands of that person. That’s what is required for the smooth procession of a legal case. You are suing John Smith, and your process serving company delivers the papers to a John Smith. The trouble is that it’s not the right John Smith. An inexperienced or unskilled process server can make this mistake. However, if you hire the right Glendale process serving company, those professionals will have the tools to find the right person and ensure that they have the right person. They will talk to friends and neighbors, search public records, do research online, and anything else they have to do to find and verify the person. Obviously, serving the papers to the wrong person can significantly delay your case. Depending on what information was served and to whom, the respondent could also be given reason to bring an action against you, such as for breach of privacy or defamation. Don’t let a server mistake cause your legal case to be derailed or delayed. Missing important deadlines can cause your whole case to be derailed in some cases, such as in personal injury claims that have to be brought within a certain timeline. In other cases, the mistake could just cause a serious delay that could cost you more in legal fees and cause you headache and heartache. ASAP Serve is a reputable Arizona process serving company that hires only professionals who have the skills and experience to avoid these common mistakes. Our professionals will provide speedy and accurate service of process so that your case moves along smoothly and quickly. Read our reviews to see what our clients have to say about our professional and dependable service, then contact us to hire a process server to get your legal case started.